When the first Intel-powered Macs started arriving on the scene in January, Mac users could find plenty of consumer applications that ran natively on Intel’s Core Duo processors. Intel-native pro apps were much harder to come by. And while many of those programs ran just fine using the Rosetta emulation technology, the non-native versions didn’t enjoy the performance gains advertised by Apple. The situation has improved dramatically since January, with more companies releasing Universal versions of their software to run natively on both PowerPC and Intel-based machines. Apple has led the charge, adding Universal compatibility to pro apps such as Aperture, Final Cut Studio, and Logic. That last application is of particular interest to musicians, who’ve been anticipating major performance boosts since Apple unveiled plans to switch to Intel-based processors. While Logic ran on a PowerBook G4, the performance was nothing to write home about; musicians on the road desired a laptop with enough power to more closely approximate the experience of running Logic on a high-end desktop. The arrival of Logic Pro 7.2 should be welcome news for those mobile musicians. Our tests of the first Universal version of Apple’s music creation and audio production software found a major performance gain when running the application on a Core Duo-based Mac. More important, running Logic 7.2 on a MacBook Pro delivers a surprisingly similar experience to using the app on a Power Mac G5, meaning on-the-go musicians may have the hardware-software combo that meets their performance demands. Just the addition of Universal compatibility is good news for Logic users; earlier versions of the program wouldn’t run on an Intel-based Mac. If you try to run a multi-track audio project under Rosetta, you’ll find degraded processor performance that can result in garbled audio on larger projects. Then again, running high-end audio programs on G4-powered laptops can be limiting compared to desktops. A PowerBook G4 can perform most basic music and audio tasks, but it often struggles to keep up with more ambitious projects. Users can freeze tracks to conserve resources on these machines, but that adds inconvenient additional steps to a workflow and limits live performance options. So would-be upgraders would be very interested to see how Logic 7.2 performs natively on a MacBook Pro. The question, then, is how exactly to quantify real-time music and audio performance. You could count the number of tracks you can simultaneously play or record, but that’s primarily a function of hard disk performance, not processor speed; what’s more, many laptop users record to fast external FireWire or USB 2.0 hard drives rather than the slower internal drive. A better indicator is what most users care about: computationally-intensive tasks like running effects and virtual instruments—especially since some of Logic’s plug-ins are voracious in their appetite for CPU cycles. Using this measure, a MacBook Pro running Logic 7.2 starts to demonstrate the 2-to-4X speed improvement over the previous PowerBook G4 Apple had touted. In Apple’s tests, a 2.16GHz MacBook Pro running Logic 7.2 processes 135 PlatinumVerb reverb plug-ins, 4.5 times as many as a 1.67GHz PowerBook G4. The MacBook processes twice as many Sculpture physical-modeling software instruments as the PowerBook. Adding multiple CPU-hungry plug-ins like Logic Pro 7.2’s Space Designer reverb can easily task a G4-based computer, but the MacBook Pro was able to handle them easily—even when using more than one would in a typical project. 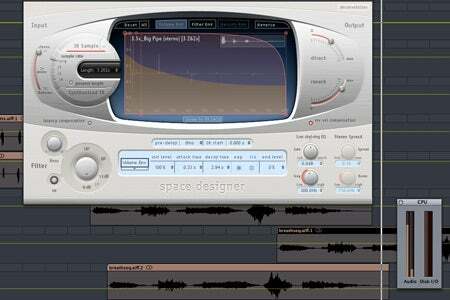 Using so many plug-ins at once tends to exaggerate the performance of certain computations. Nevertheless, these kinds of numbers were consistent with our hands-on, real-world testing of plug-ins. In a real-world project, you’re extremely unlikely to use 135 reverbs at once, but you might want to use a number of CPU-hungry plug-ins. To test Logic’s performance on the MacBook Pro, I used an actual multi-track sound-design project that needs to combine multiple instances of Logic’s most punishing plug-in, the Space Designer convolution reverb. I found that there was little I could do to overtax the MacBook Pro. This project managed to play in real-time even after adding 13 Space Designers with long reverb tails, plus three Pitch Shifter II instances and one Ring Shifter. This represents the upper limit of the MacBook’s performance; you’ll see in our test results that even a marginally-slower dual-core Mac mini was unable to play the same file. But the MacBook Pro performs fast enough to meet the needs of most mobile users, and it subjectively feels like a fast desktop. But in day-to-day use, the experience of using the MacBook is not very different from using a high-end Power Mac, a radical departure from the G4/G5 divide of the past. The Mac mini also performed admirably, and could also make a good music machine. Unlike the G4-based minis, even the Mac mini Core Solo is also usable as a Logic Node; you could connect it to other fast G5 or Intel Macs for distributed processing of Logic projects, adding to the mini’s value. Lastly, Logic now includes support for high-end hardware and software products. Logic Pro 7.2 has integrated support for Apogee’s new PCI express and FireWire audio interfaces and for the high-quality pitch and tempo shifting of Serato Pitch ‘n Time LE. The latter is a pleasure to use: I tested a beta version, and the release offers dramatically improved pitch and tempo changes when compared to Logic’s integrated algorithms, while integrating seamlessly with Logic’s intuitive Time and Pitch Machine interface and the Arrange window. There’s only one reason not to upgrade to Logic Pro 7.2, but only if you use older Digidesign hardware and software. While Logic Pro 7.2 expands support for Pro Tools 7.x, it discontinues support for Pro Tools 6.9 and earlier. Like Pro Tools HD 7, Logic no longer supports Digidesign MIX systems. Test numbers and feature additions aside, what ultimately matters for music production is the line between being able to do what you want on a project, and having to compromise, particularly in live performance. Using a svelte Mac laptop or bargain-priced Mac mini is no longer the compromise it had been for running Logic Pro. That bodes well for other high-end audio applications released or due to be released for Intel-based Macs. If you rely heavily on plug-ins, you’ll want to wait to make an Intel Mac your primary machine until more Universal arrives, as each plug-in must also be optimized for the Intel processor to function. But if you’ve been waiting for a fast machine in a laptop, mini, or iMac form factor, the Intel “brain transplant” has paid off immediately. Editor’s Note: This article was updated on April 27 at 10:03 a.m. PT to clarify information about Logic Pro 7.2’s support for ReWire.